I wanted to say hello and check in! 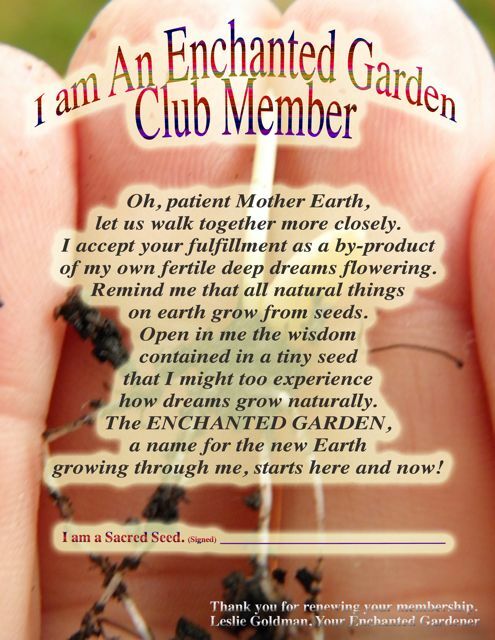 Thanks for being in the The Enchanted Garden Club and supporting our work to Win Back Our Sacred Seed Nature, through helping each person connect personally with Nature’s Original Technology. 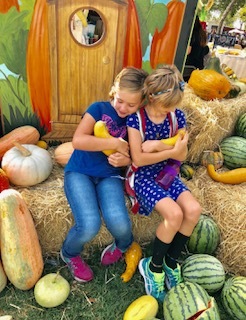 In 2018, we reached hundreds of kids through our Squash Adoption Booth at the National Heirloom Expo and we shared messages of healing at the AIHM and PCOM conferences, as well as in the hospital setting,where I personally learned the power of holding true to my belief in self-healing. Adrienne Prince and I are partnering to combine our energies and visions to serve our Team GAIA and Enchanted Garden Club Members even more deeply in 2019. We are launching new inspirational videos to reach more people with the core essential teachings we are discovering, about how we can all work together to heal the planet, through using our Secret Superpowers of conscious intention. We will also continue making the #PlantYourDreamBlog posts, reprinting my most beloved books, and planting more dreams so that we can beautify the world through the #PlantYourDream message of allowing our Seed Dreams to be in the driver’s seat of our lives. How are your Dreams growing? Please tell us what's unfolded for you so far this year. Tell us how we can do to support your vision in the world. May 31, 1992|Bob Baker | Bob Baker is a Times staff writer. I've been waiting half my life to tell somebody about Leslie Goldman. Always figured I'd wait for some desperate moment. Now it's here. In You, I see the flowers I love so much in the garden. Nature has smiled on you to make this world beautiful. that grows One rare Heirloom Seed and #SeedSacred at a time. Plant a Seed. Grow A Whole New Earth! This #PlantYourDreamBlog Post Contains Keys for Winning Back Your Own #SacredSeed Nature. I recommend you turn breakdowns into Breakthroughs through utilizing #PlantYourDream Seeds. You are invited to learn, review, and apply the TIps to Win Back Our Sacred Seeds and in doing so, Outgrow GMO's ( Just one of the things we need overcome for a Pure Food Revolution). Adrienne Prince is meticulously helping me edit a major piece of writing for 2017. We are working back and forth and this takes a lot of listening and surrender, working with an editor. She is reminding me that it is is Male-Female collaboration and listening that ends the Drought in Our Lives. It is profusely raining now, and I am witnessing to the symphony of the rain that seems to be in harmony with our interacting. 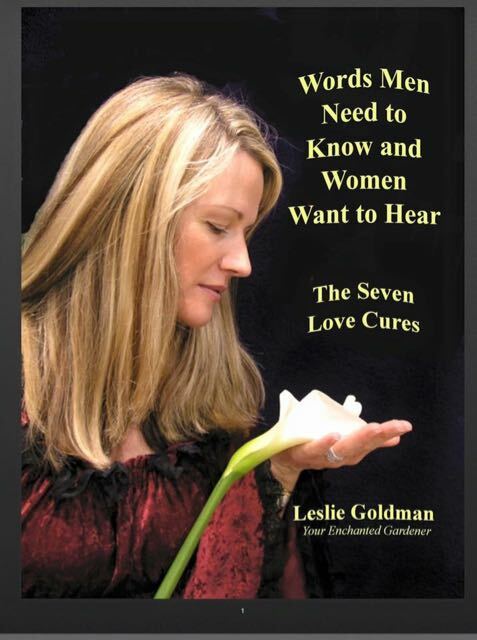 That is what the Seven Love Cures, #WordsthatMenNeedtoKnowandWomenWanttoHear is all about. yet I am the Love this New Earth has created for this moment." 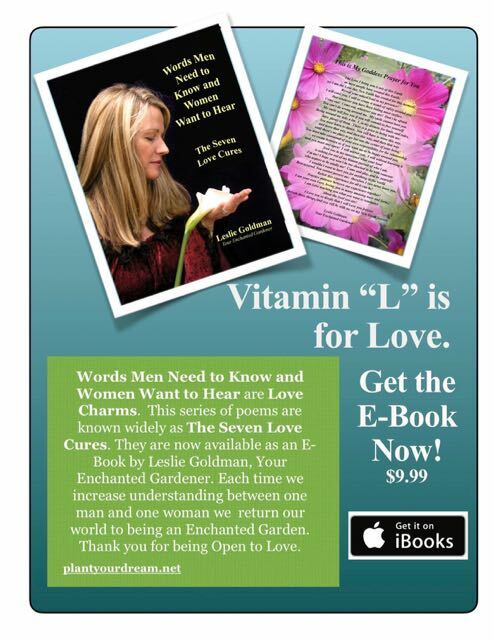 The Seven Love Cures are Words that men need to know and women want to hear are here for you. to exist for millions of years to come. which is only a silent force. This is not a physical contact. or which, I, too, am a part." This was one of the favorite quotes of Edmond Bordeaux Szekely, the modern Essene Renaissance leader and co-founder of Rancho La Puerta, the destination spa in Tecate, Mexico. Romain Rolland Forming the New Ground Your enchanted Gardener. let us cull it wherever we can find its blossom or its SEED. Having Found the seed, let us scatter it to the winds of heaven. Where ever it may blow, it will germinate. that will form the new ground." towards a new youth. It is the myth of America." 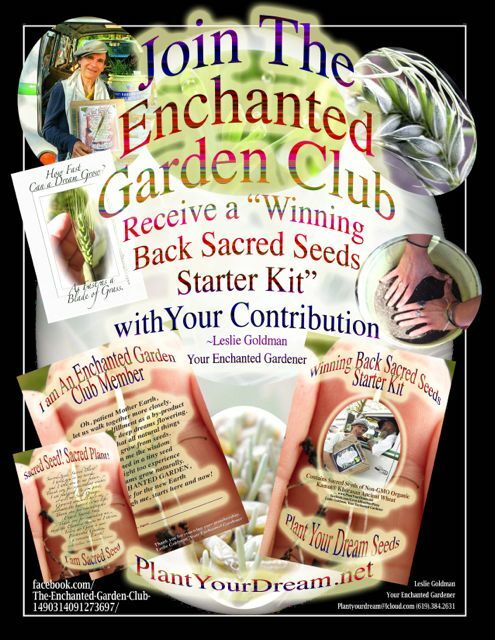 The Starter Kit aims to inspire you to Win Back Your Own Sacred Seed. It contains @RareSeeds of Ancient wheat provided by Kamut Internation. These are Plant Your Dream Seeds. The Kit was produced by Baker Creek Heirloom Seed Company to support this ministry to Rebirth our Mother Earth as we each, as #RareSeeds reconnect with nature through the simple act of growing some of our own food in a pot. let us walk together more closely. are your fulfillment and renewal. how my dreams grow naturally. 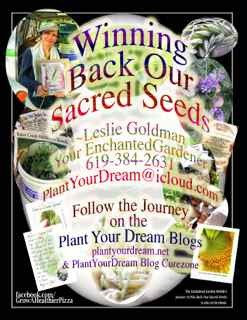 --Leslie Goldman, Your Enchanted Gardener @YourEG @PlantYourDreamBlog Curezone and Wordpress. Like what you see on the @PlantYourDreamBlog? 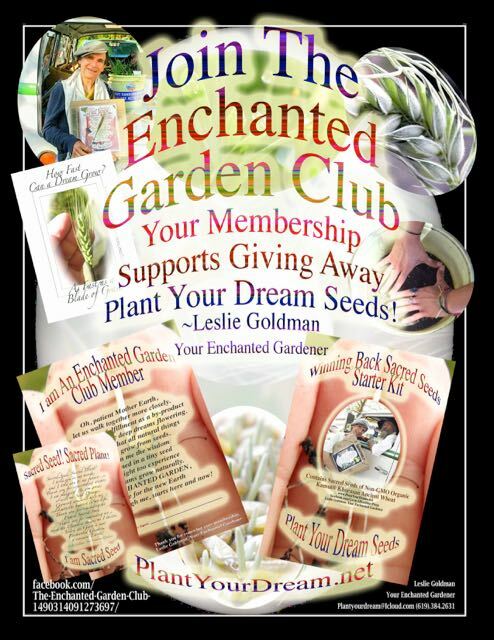 Join the Enchanted Garden Club! 1. Contribute here. 2. Add your name on The Enchanted Garden Club Membership Page Facebook to keep in touch. The Leslie Goldman Twitter is @YourEG. My YouTube Videos are Here: The Sacred Seed Prayer. 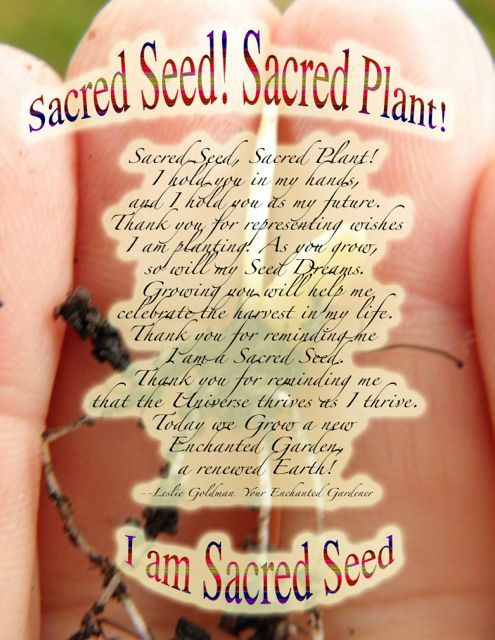 As You Plant Your Dream, Say This Sacred Seed Poem. and I hold you as my future. so will my Seed Dreams. celebrate the harvest in my life. I am a Sacred Seed. that the Universe thrives as I thrive. 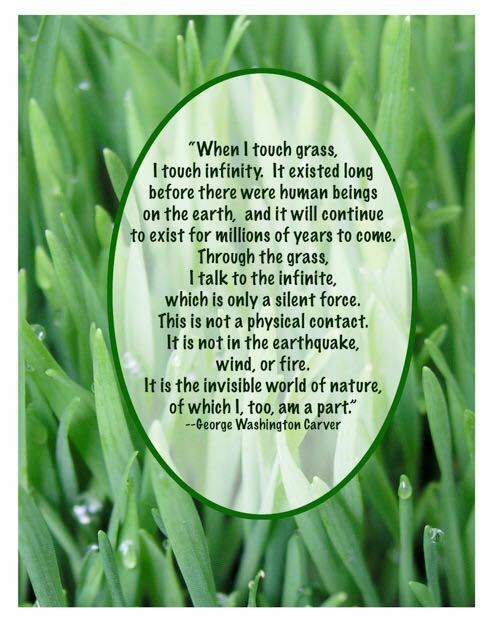 Spread the word and reconnect with your rightful relationship with Nature. 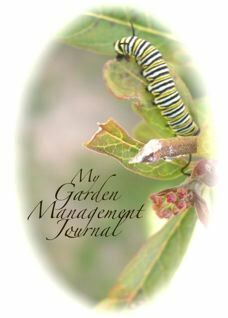 LIKE WHAT YOU SEE ON THE PLANT YOUR DREAM BLOG? Rather than Against, March toward your Dream! These are my Seed Dreams for 2016.
and says When I look at you I see #RareSeeds. "This Earth is Ours! We are All Growing in the same pot! This article, published in The Life Connection as well, was inspired by this talk. 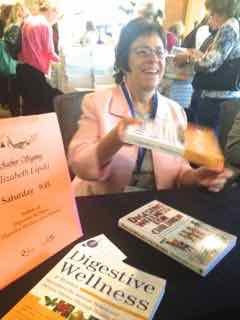 Leslie Goldman, "Your Enchanted Gardener," Plants Seeds of Success for super Ripe People and their Dreams. A noted ceremonialist in the eyes of Mother Earth and a full time blogger, he records his ongoing activity and mystical adventures on the Plant Your Dream Curezone Blog (13 million page views). 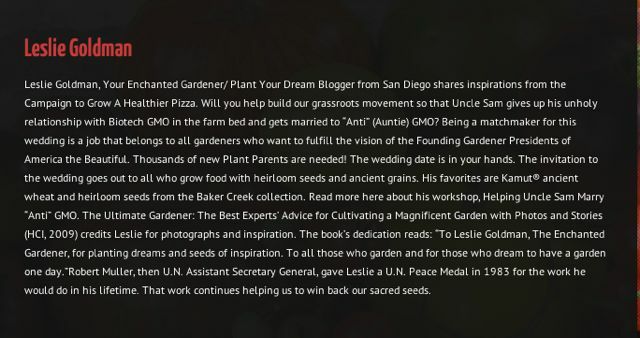 He writes about his Campaigns and Sponsors on the Non GMO, Organic & Fair Trade Shopping Guide on Plant Your Dream Word Press ( million page + views). Leslie travels in a 1968 Volkswagen van, a celebrity in her own right. A conversation starter, this classic 68 is on The Enchanted Garden Mobile's Journey to Win Back Our Sacred Seeds, heading toward teaching at the The National Heirloom Expo, Sept 8-10, 2015, in Santa Rosa, CA. Leslie is called California's Johnnie Appleseed. 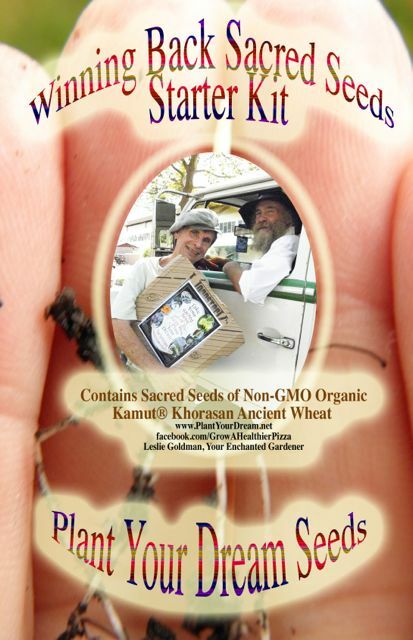 Their mission--he and his vehicle- is to alert Rare Seeds, individuals living out their soul purpose, to the power that comes from growing out original heirloom seeds. Growing these seeds honors biodiversity of the gene pool and keeps vibrant the unique cultural history in each seed. Growing these seeds reconnects us to our own #RareSeed nature and showers us with plant Blessings. 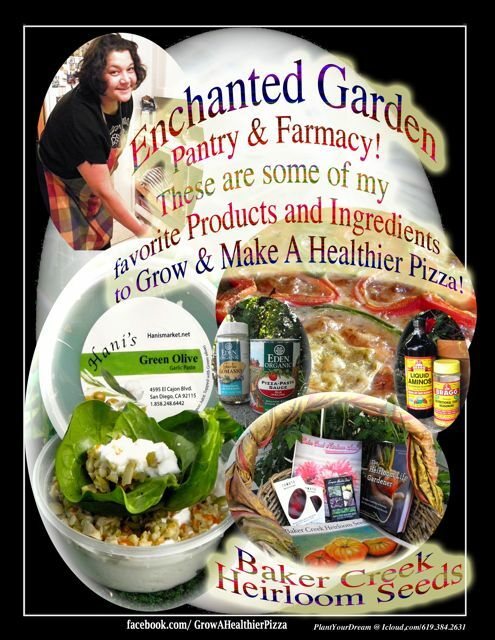 The Enchanted Garden, a name for our renewed earth that grow through each of us, Welcomes You to Join The Enchanted Garden Club!! My Winning Back My Sacred Seed Biz Card. Be in touch. 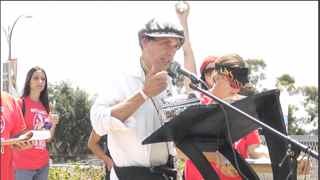 This is the beginning of my talk at the March Against Monsanto, Balboa Park, May 23, 2015. This article, "Tips for Winning Back Our Sacred Seeds, Outgrowing GMOs" was inspired by this video. I have been writing on the theme of Winning Back Our Sacred Seeds for more than a month. The following article is part of this larger piece. "Winning Back Our Sacred Seeds" in many parts The Index with be forthcoming. 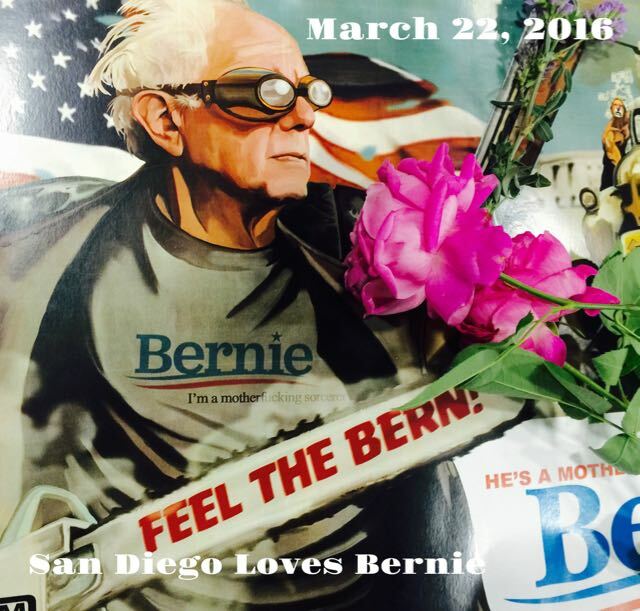 This is a direct link to our second The Anti-Media Broadcast on Lavonne Queenlovecat Mireles Friday night Radio Show. https://www.facebook.com/YourEnchantedGardener/media_set?set=a.10153504030412235.1073742190.504567234&type=3 — at San Diego March Against Monsanto. 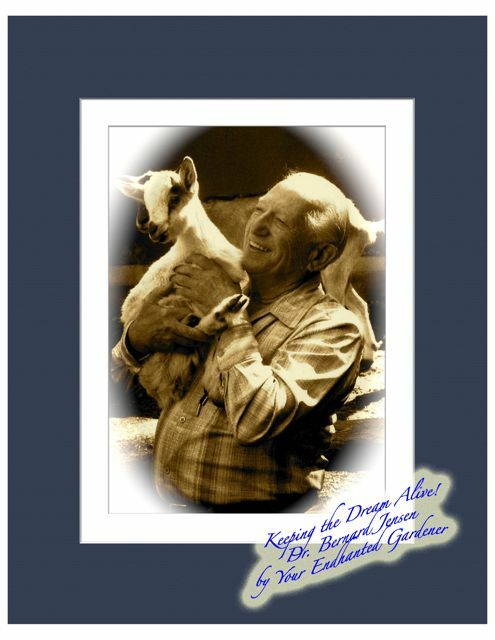 I went with this image for the Baker Creek Heirloom Seed Company Seed packet. 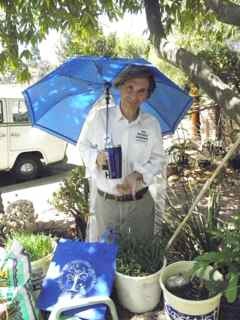 This Morning, As I Was Writing About Charlotte Tenney, A Founder Of The Trees For Health Garden Balboa Park, It Began To Rain!!! 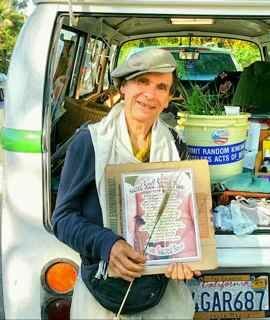 Leslie Goldman, Your Enchanted Gardener and Mo Roufé hold up a 100 year calendar that began in the year 1950. When will the @TheMonsantoYears End for You? Plant Your Dream now! Call in and join the chat and conversation. Here are Tips for Winning Back Our Sacred Seeds. In doing so, we can Outgrow GMOs. My mission now is to alert Rare Seeds (#RareSeeds) individuals living out their soul purpose to the great power that comes from growing original heirloom seeds ( @RareSeeds) ; Heirloom Seeds are more popular now thanks to The National Heirloom Expo Next event: Sept 8-10 in Santa Rosa, Ca, See @heirloomexpo. Heirloom Seeds honor gene pool biodiversity. They keep vibrant our unique cultural history and future. Growing Rare Seeds reconnects me to my own Rare Seed nature and showers me with plant blessings. been called the Prophet’s Wheat. Grow in a pot or the ground. They will teach you many lessons. Plant Your Dream with these seeds. into the hands of her Eminent Gardeners. Be That Gardener. Win back our Sacred Seeds. 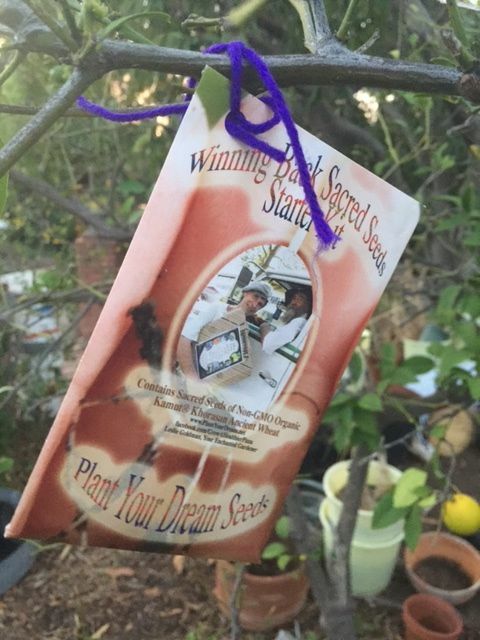 Plant Your Dream in an inspired hour with California's Johnny Appleseed and popular Non-GMO, Organic & Fair Trade Shopping Guide Blogger. 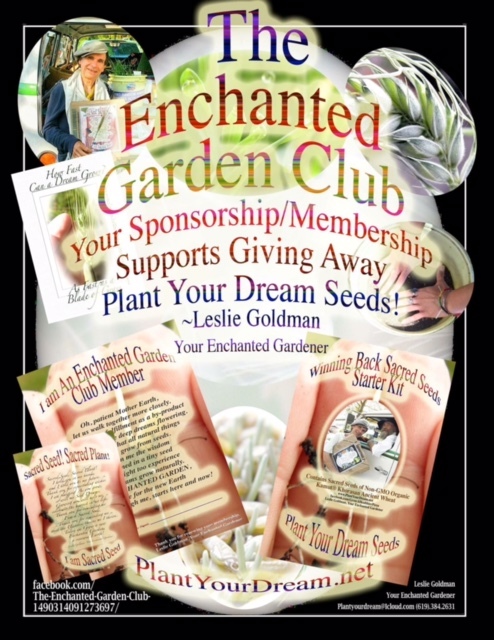 Leslie Goldman, Your Enchanted Gardener, says "In you, I see Rare Seeds intended to create a more beautiful world." He shares Tips for Winning Back Our Sacred Seeds and says that in following these, we can Outgrow GMOs. His mission is to alert Rare Seeds--individuals living their Soul Purpose--to the power that comes from growing out original heirloom seeds. He says that this is a key to turn our world into an Enchanted Garden Club. Leslie introduces Three Simple Beginner Plants to harvest from pots. 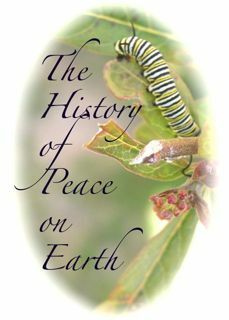 As we open us to the wisdom contained in a tiny heirloom seed we return our planetary beat with nature. Leslie travels in a 1968 Volkswagen van, a celebrity in her own right. A conversation starter, this classic '68 is on The Enchanted Garden Mobile's Journey to Win Back Our Sacred Seeds, heading toward teaching at the The National Heirloom Expo, Sept 8-10, 2015, in Santa Rosa, CA. Leslie is called California's Johnnie Appleseed. 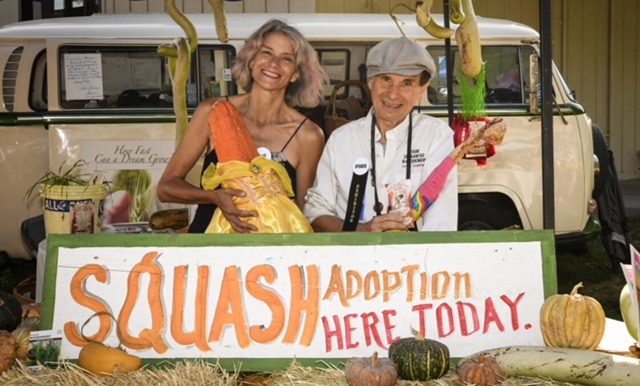 Their mission--he and his vehicle- is to alert Rare Seeds, individuals living out their soul purpose, to the power that comes from growing out original heirloom seeds. Growing these seeds honors biodiversity of the gene pool and keeps vibrant the unique cultural history in each seed. Growing these seeds reconnects us to our own #RareSeed nature and showers us with plant Blessings. The Enchanted Garden Welcomes You! 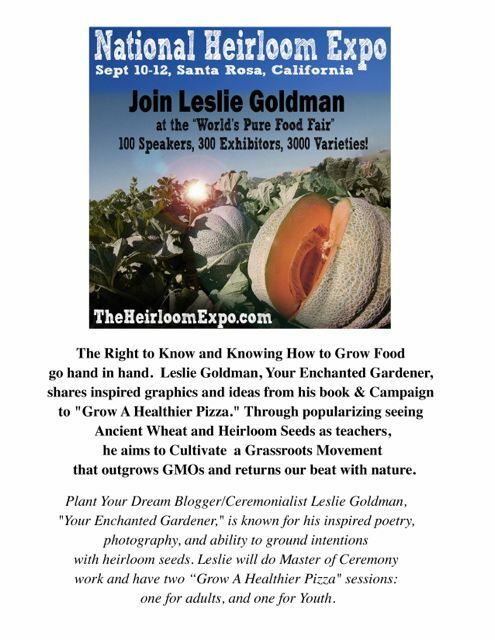 Join Leslie Goldman, Your Enchanted Gardener @YourEG #PlantYourDreamBlog as We plant our Seed Dreams at the National Heirloom Expo 2015. Together We can Plant #OpenAccessToFood For All and the Deepest Dreams we are meant to Grow Through Our Lives! PLEASE SUPPORT WINNING BACK OUR SACRED SEEDS. This Art, How Fast Can a Dream Grow! As Fast as a Blade of Grass! is the centerpiece of our Grow A Healthier Pizza Campaign. Canvas copies are available. Contact me, 619.384.2631. The Prototype Job's Tears Greeting Card, and the Grow A Necklace Enchanted Garden Bead Seeds! The story of Job for me is the seed for these times. We have near lost everything our health and wealth, but we cannot lose faith. 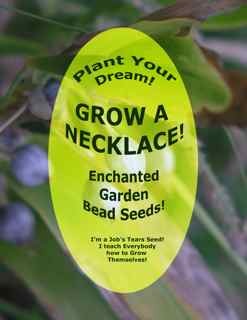 I am looking for growers to begin growing out these for the most part ornamental seeds that can be turned into necklaces for kids, i.e, Enchanted Garden Bead Seeds. Job's Tear seeds come with a hole already running through them. All you have to do is push a thin wire through the hole. 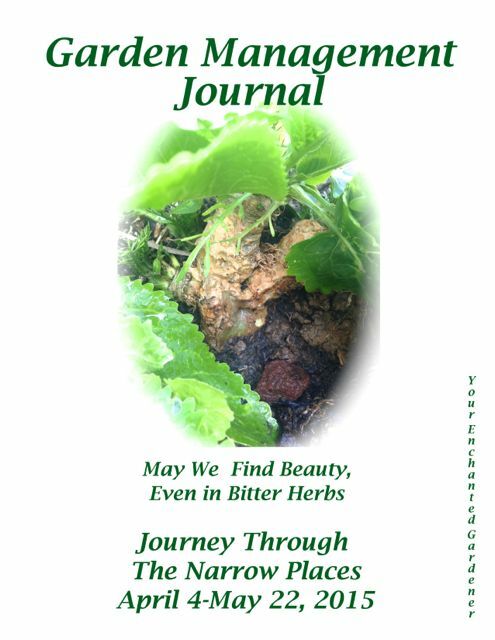 "Garden" is a metaphor for Consciousness; The "Management" is intended to be each of us in our own Lives; "Journal" refers to recording your Journey through life and see your life as one page in the History of Peace on Earth; "Plant Parenthood" is a name for the process where through parenting plants, we are reparented in the Laws of Nature, intended to guide us on the hero/heroines Journey. Keep a Journal. It will slow you down. Experience and Patience are the rules of living well. Journaling is an honoring process. It is taking time to honor our Sacred Seed. In honoring our Sacred Seed, we help Win Back Our Sacred Seeds. Winning Back Our Sacred Seeds is my theme for 2015 that I will teach at the National Heirloom Expo, September 8, 2015. How did it come out! Leslie Goldman, with the Plant Your Dream Blog interviews Jere Gettle at the National Heirloom Expo 2013 The 4th Annual Expo is September 9-10-11 2014. Music is by Riki Newell, Angel's Day on Earth. 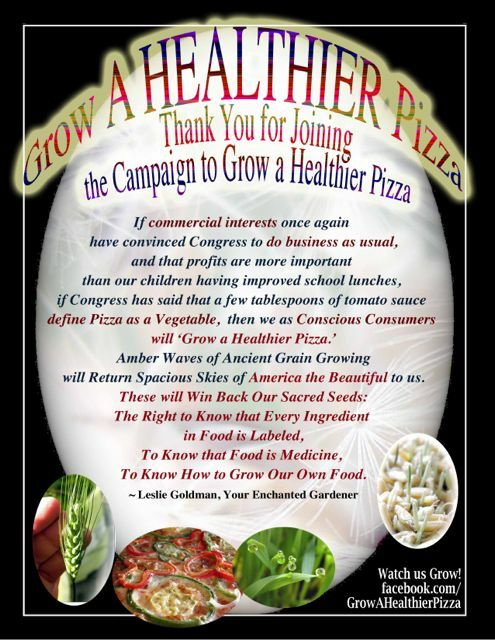 Please join the Campaign to Grow A Healthier Pizza to Win Bach our Sacred Seeds. Our 2014 education initiative is Uncle Sam Marries "Anti" GMO. I ordered some memorability from the Simpson Public Library site that arrived August 18, 2014. I would like to take these to The National Heirloom Expo September 9,10,11 in Santa Rosa, Ca, where I will teach as well as participate in a National Seed Library Summit. 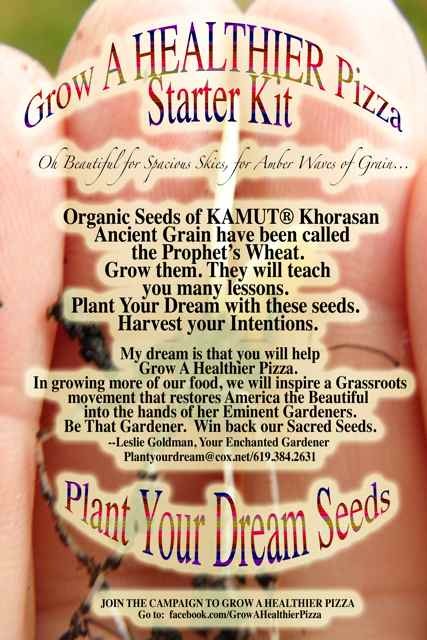 I went into the garden to plant Ancient Grains of Kamut ® Khorasan wheat today that had been sprouting during the last week. I am planting seeds for clarity around the Simpson Seed Library-Department of Ag Communications. May good come from the communication. May all our work pave the way for Seed Libraries to continue to flourish with the well wishes of all. May a National Conversation emerge in support of Seed Saving, Support for Seed Libraries, and GMO Education. I wrote Plant Your Dream Blogs to contribute to this clarity and good outcomes. Today, I heard from Johnny Zook, Seed Program Supervisor, Penn Department of Ag, and Jonelle Darr, Cumberland County Executive Director, home of the Simpson Seed Library. Darr thanked me for attempting to correct the facts and said, "From what I could see, the information that you have regarding my statements, and the library's actions are correct." Johnny Zook said he liked the story and that I included what needed to be told regarding their communications. Here is the story, "Planting Clarity! Simpson Seed Library and Ag Dept Wrap Up," "Planting Clarity! Simpson Seed Library and Ag Dept Wrap Up," --Leslie Goldman, Your Enchanted Gardener, August 18, 2014. View the future! This is the Petaluma Seed Bank, where the dreams and visions of a teenager years ago, Jere Gettle, gave birth to the Baker Creek Heirloom Seed collection, and with the help of an outstanding staff, the upcoming National Heirloom Expo September 9,10,11, 2014. The national Seed Library movement was not on my radar until Johnny Zook, Seed Program Supervisor for the Penn Department of Ag wrote a well intended letter to the newly formed Simpson Seed Library in Mechanicsburg, PA, June 12. He let them know that there were state Seed Laws. A few months later, we have an opportunity, as Departments of Ag everywhere are looking into Seed Library Protocols and how individual Seed Laws relate to Seed Libraries. Will you, as a Seed Saving Enthusiast, as a Supporter of Seed Libraries, as a GMO Educator. answers some informed answers to Johnny Zook so that National Seed Library Protocols can reflect deep wisdom? This was started Thursday, August 28, 2014. 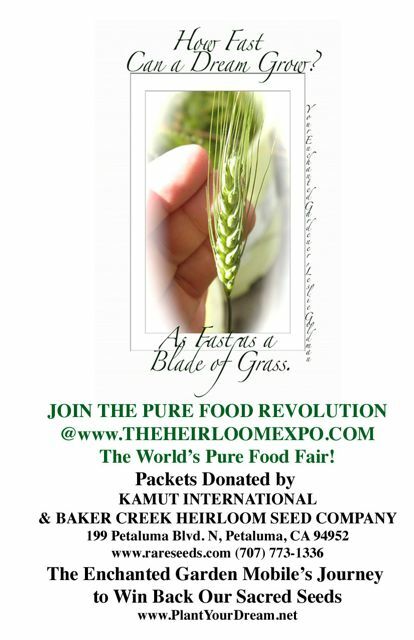 These are teachings for the National Heirloom Expo, September 9,10,11, 2014 in Santa Rosa, California. Leslie can be reached at Plantyourdream AT cox.net or at 619.384.2631. Please see a list of the National Heirloom Expo presenters here. at 11:30 Tuesday, September 9, in Kraft Hall. I am scheduled to teach Growing a Healthier Pizza with Plant Your Dream Seeds, with the youth, at 12:15-12:45 pm,, Wed, September 10, 2014 in the Educational & Fun Area. 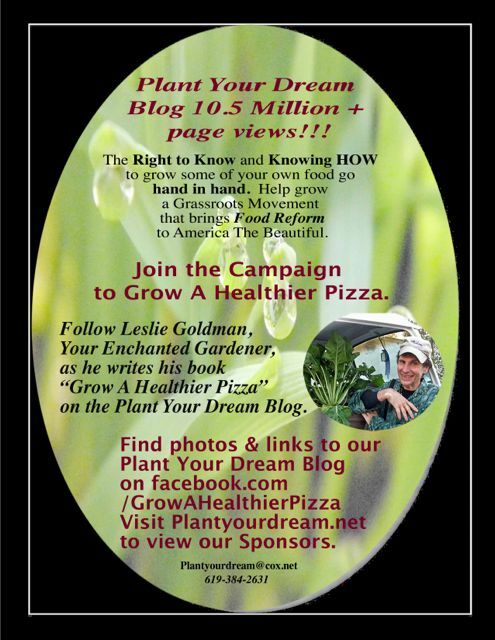 Leslie Goldman, Your Enchanted Gardener/ Plant Your Dream Blogger from San Diego shares inspirations from the Campaign to Grow A Healthier Pizza. Will you help build our grassroots movement so that Uncle Sam gives up his unholy relationship with Biotech GMO in the farm bed and gets married to “Anti” (Auntie) GMO? Being a matchmaker for this wedding is a job that belongs to all gardeners who want to fulfill the vision of the Founding Gardener Presidents of America the Beautiful. Thousands of new Plant Parents are needed! The wedding date is in your hands. The invitation to the wedding goes out to all who grow food with heirloom seeds and ancient grains. His favorites are Kamut® ancient wheat and heirloom seeds from the Baker Creek collection. 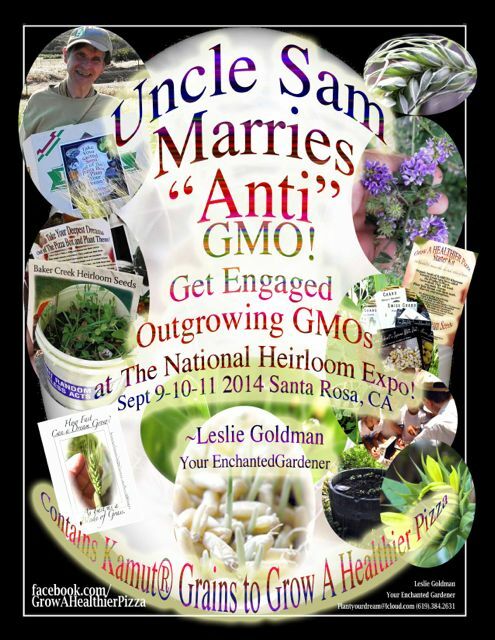 Read more here about his workshop, Helping Uncle Sam Marry “Anti” GMO. The Ultimate Gardener: The Best Experts’ Advice for Cultivating a Magnificent Garden with Photos and Stories (HCI, 2009) credits Leslie for photographs and inspiration. 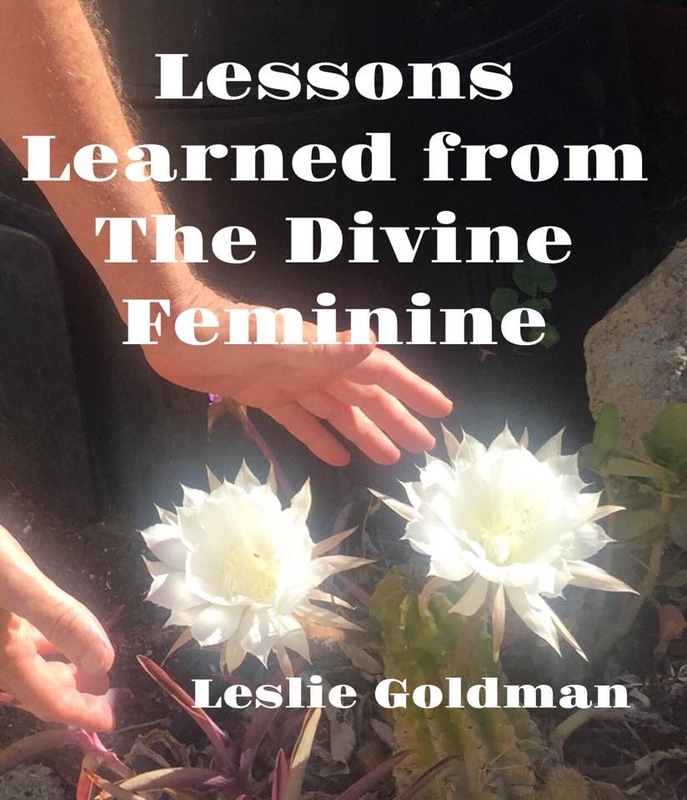 The book’s dedication reads: “To Leslie Goldman, The Enchanted Gardener, for planting dreams and seeds of inspiration. To all those who garden and for those who dream to have a garden one day.”Robert Muller, then U.N. Assistant Secretary General, gave Leslie a U.N. Peace Medal in 1983 for the work he would do in his lifetime. That work continues helping us to win back our sacred seeds. The Simpson Public Library has done a wonderful job of detailing the main communications about the unfoldment of these events. A GROWING NUMBER OF SEED LIBRARIES NOW EXIST IN MANY PUBLIC LIBRARIES. Seed libraries, often located in public libraries or other community gathering points, are institutions created for the purpose of sharing seeds. The idea is that a library patron can “check-out” seeds to grow themselves, let “go-to-seed”, and then return seeds to the library to share with other community members. The seeds circulated at lending libraries are usually regionally-adapted and heirloom (unlike most commercial “hybrid” seeds, so that the next generation of seeds will produce plants similar to the parent plant). The purpose of most seed libraries is to provide an alternative to genetically modified seeds, increase biodiversity and plant resilience, and reconnect local people with their food systems. The issue that surfaced through interactions between the Simpson Seed Library and the Pennsylvania Department of Ag was the problem of returning seeds to the Public Library Seed Library. This brought the Seed Library under regulation through the Seed Law of Pennsylvania that has specific rules for seed distributors, Many States have similar seed laws that mirror a Federal seed Law. David King, who founded the Seed Library of Los Angeles, asks the question in one recent Post, "Are Seed Libraries Illegal?" He is heavily quoted on other subjects in Naomi Cleason's August 5 story in the Carlisle Sentinel "Pa. department backs seed library protocol as reaction grows" . Others are exploring, "Setting the Record Straight on the Legality of Seed Libraries". 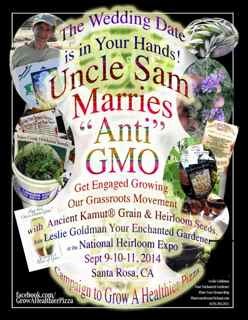 WILL YOU HELP UNCLE SAM MARRY "ANTI" GMO? 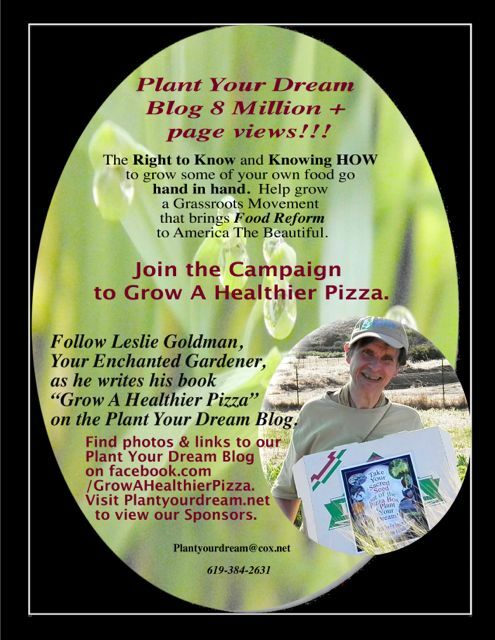 Leslie Goldman, Your Enchanted Gardener/ Plant Your Dream Blogger from San Diego shares inspirations from the Campaign to Grow A Healthier Pizza. 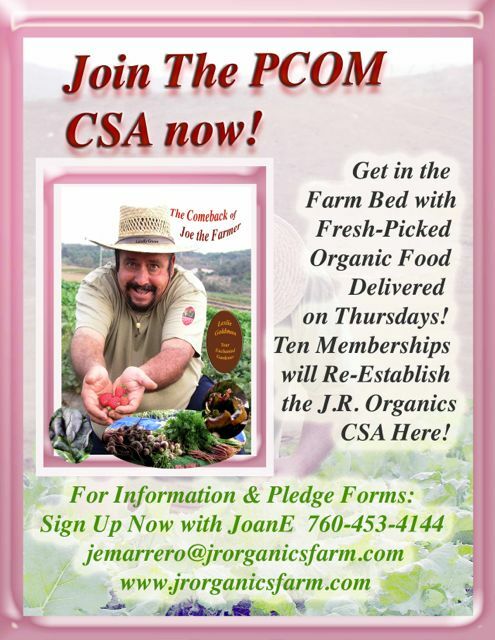 Will you help build our grassroots movement so that Uncle Sam gives up his unholy relationship with Biotech GMO in the farm bed and gets married to “Anti” (Auntie) GMO? Being a matchmaker for this wedding is a job that belongs to all gardeners who want to fulfill the vision of the Founding Gardener Presidents of America the Beautiful. Thousands of new Plant Parents are needed! The wedding date is in your hands. The invitation to the wedding goes out to all who grow food with heirloom seeds and ancient grains. His favorites are Kamut® ancient wheat and heirloom seeds from the Baker Creek collection. Read more here about his workshop, Helping Uncle Sam Marry "Anti" GMO. Robert Muller, then U.N. Assistant Secretary General, gave Leslie a U.N. Peace Medal in 1983 for the work he would do in his lifetime. That work continues helping us to win back our sacred seeds. Read Notes for many of the speakers here. This year I am creating the intention that there is a celebratory Wedding up ahead for the United States to regain our original vision. Will you help build a grassroots movement so that Uncle Sam gives up his unholy relationship with Biotech GMO in the farm bed and gets married to “Anti” (Auntie) GMO? 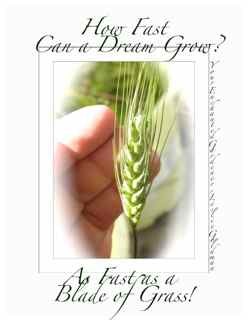 The invitation to the wedding goes out to all who get engaged growing Heirloom seeds and ancient grain. The wedding date is in your hands! Being a matchmaker for this wedding is a job that belongs to many Anti-GMO Activists who I want to encourage to become gardeners. In taking up gardening, we can fulfill the vision of the Founding Presidents of America. Our first Presidents had deep relationships with nature. I believe their vision can literally restore a more beautiful America. Andrea Wulf took up the theme in her book, “Founding Gardeners.” She states, " It’s impossible to understand the making of America without looking at the founding fathers as farmers and gardeners." I see the need for thousands more gardeners and small size farmers rather than have our food supply centralized in the hands of a few growers. This is the continuation of our original vision. This year, I want to encourage you not only to fight against a system of agriculture that is failing us, with power over food in the hands of a few, but through gardening with intention, help return a new vision of America the Beautiful. For more information, please join The Campaign to Grow A Healthier Pizza on Facebook. Many seed freedom enthusiasts will be coming together at the upcoming National Heirloom Expo September 9, 10, 11 in Santa Rosa, California. I can be reached at Plantyourdream AT cox.net or at 619.384.2631. 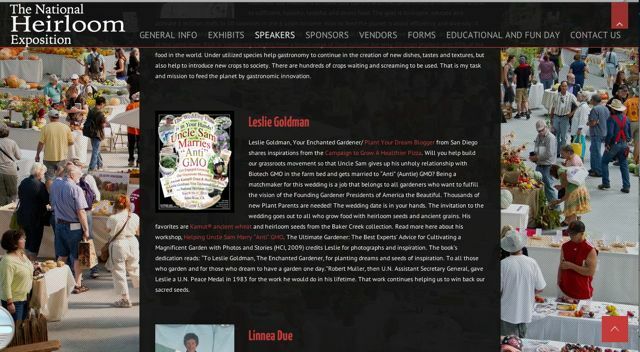 To see the Presenters list, go to the National Heirloom Expo website here. WE Gotta get engaged before THEY get married! This week’s show originally aired on August 20, 2013. I am looking forward to submitting these to Baker Creek Rare Seeds for inclusion on a Seed Packet or two. the plants they could be? ‘packages’ and grow the ‘plants’ they can be? How much passion and life would we feel? in her cornucopia of earthly abundance. The Rising Up of Auntie GMO….Please help breathe increased life and vitality into Anti (Auntie) GMO. Organic Seeds of Kamut® Khorasan Ancient Grain have been called the Prophet's Wheat. Grow them. They will teach you many lessons. Plant Your Dream with these seeds. Harvest your Intentions. My Dream is that you will help Grow A Healthier Pizza. In growing more of our food, we will inspire a Grassroots movement that restores America the Beautiful into the hands of mer Eminent Gardeners. Be That Gardener. Will back our Sacred Seeds. 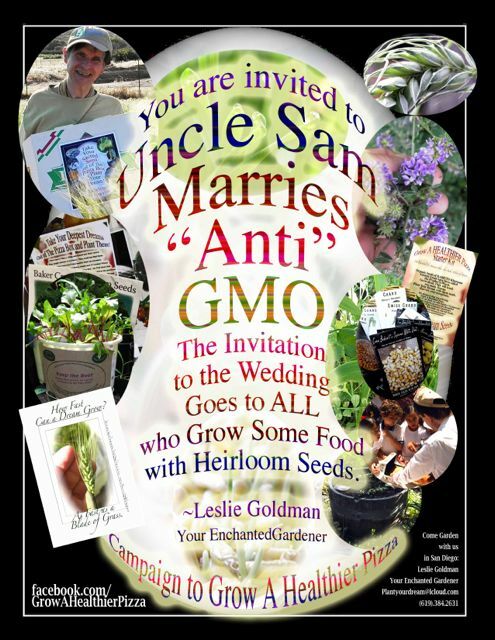 --Leslie Goldman, Your Enchanted Gardener To Learn more about Uncle Sam Marries "Anti" Auntie GMO. On the Wonderment of Seeds--Thoreau's Quote and My ideas about Seeds. 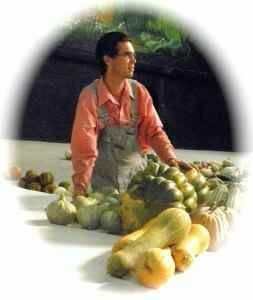 My workshop is one of 100 offered at the National Heirloom Expo, September 9-10-11, 2014. 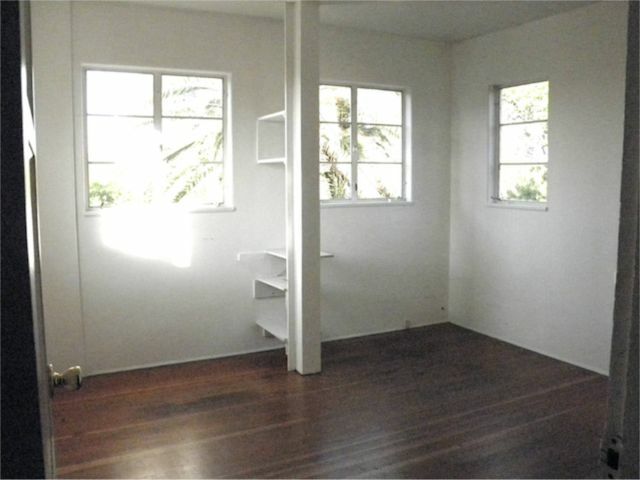 Please note: The Full rent for this room in our shared home is $640.00. There is a reduced option to pay, $520.00 with doing 12 hours of extra work per month. We also also ask everyday cleanup after your self. 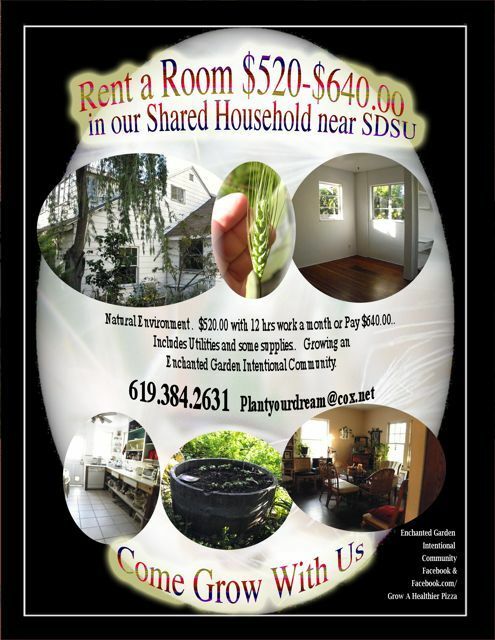 COME GROW WITH US AN ENCHANTED GARDEN INTENTIONAL COMMUNITY! This is one of the dreams I have for home, a shared refrigerator and pantry with products from my best sponsors. This is a Chapter from my Book "Grow A Healthier Pizza," a book about my personal journey to inspire Food Reform and Winning Back our Sacred Seeds. To Follow Links as they are written, please join the Campaign to Grow A Healthier Pizza Facebook page. On this Facebook page I link my Instagram Photos for current events, and Chapters of the book both on the Curezone Plant Your Dream Blog, My Daily Journal and here on Plant Your Dream Word Press. 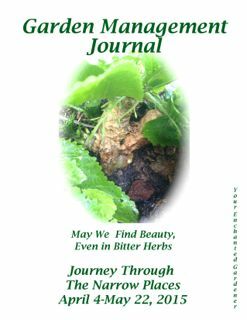 A raw Table of Contents on Curezone is here I am developing the finished chapters here on the Plant Your Dream Word Press site. This was my deepest graphic during the High Holidays, the Trip to the National Heirloom Expo 2013, and Thanksgiving. 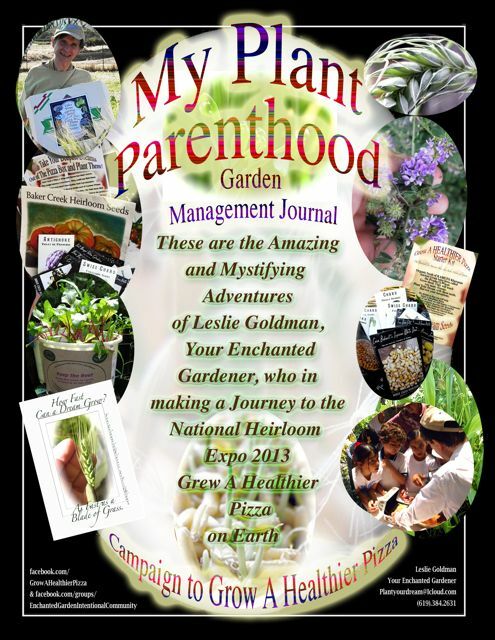 Leslie Goldman “Your Enchanted Gardener,” is a ceremonialist and full time blogger. 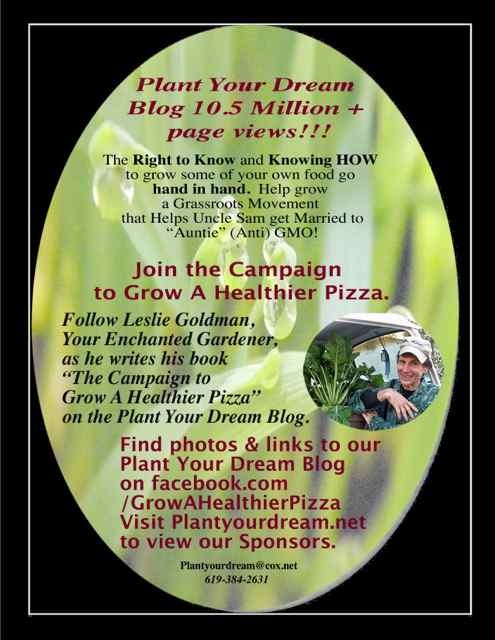 His Plant Your Dream blog with more than 8.7 millionpage views shares inspired graphics and ideas from his book and Campaign to Grow A Healthier Pizza. 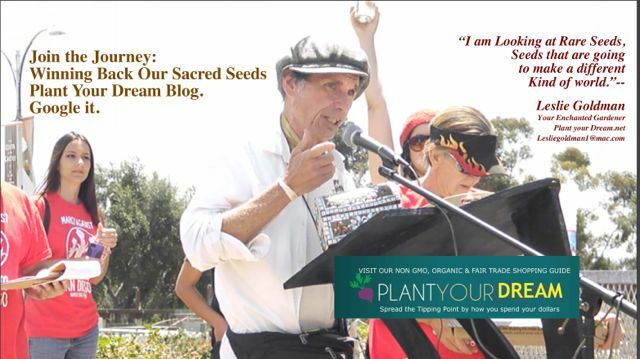 He is a long time Food Activist working with local organic farmers in San Diego, and in 2012-2013 has been a teacher at the National Heirloom Expo in Santa Rosa, a gathering place for Seed Freedom advocates. 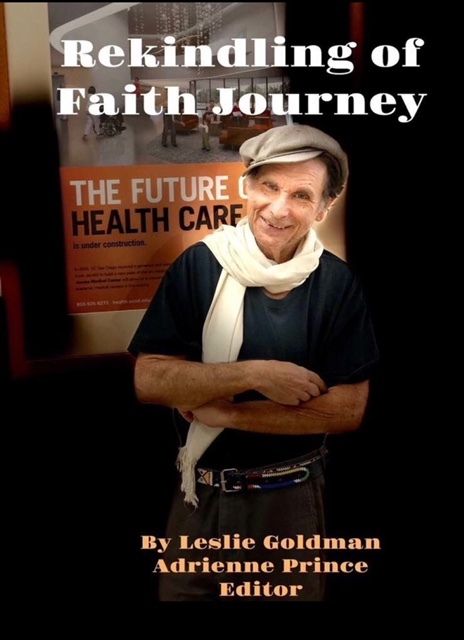 His introduction to health principles came with training with Dr. Bernard Jensen, an elder in the national healing arts, and Edmond Bordeaux Szekely, co-founder of Rancho La Puerta, who introduced him to a foundation in health. Leslie's current work is dedicated to Food Reform in America and Winning Back Our Sacred Seeds. Through popularizing seeing ancient wheat and heirloom seeds as teachers, he aims to cultivate a grassroots movement that outgrows GMOs and returns our beat with nature. Robert Muller, then U.N. Assistant Secretary General, gave Leslie a U.N. Peace Medal in 1983 for the work he would do in his lifetime. That work continues. Original Vision Planted....December 2007.--Maria Lopez was Student Gov President...she took the ball and ran with it. She came and visited me at the Hillcrest Farmer's Market. The following graphic is embedded with keys to get our power back as We The People. 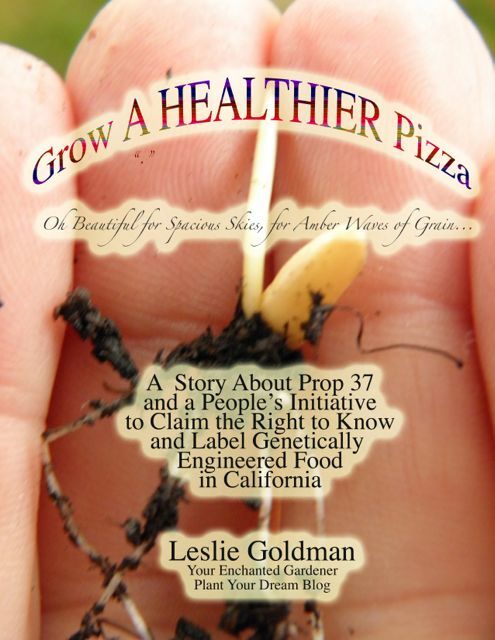 I look forward to writing about this in my book, Grow A Healthier Pizza. Made this Graphic earlier today, November 2. 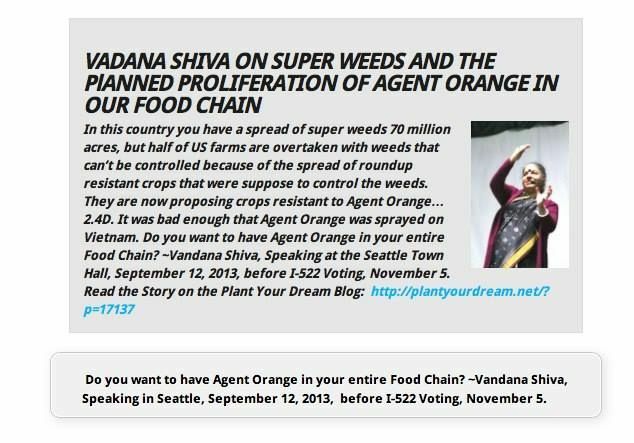 It is from the talk you can listen to here by Vandana Shiva, around minute 24. TABLE OF CONTENTS FOR "GROW A HEALTHIER PIZZA"
I add chapters and Relevant Blogs to this as I made them. Seeds in a circle are waiting for each of us to enter Plant Parenthood. They are concerned that much of our energy is getting diverted. Protesting and defending needs to balance with Outgrowing GMOs, the Seeds say. A Shift in consciousness is needed, and we are the vehicles for this shift to happen. 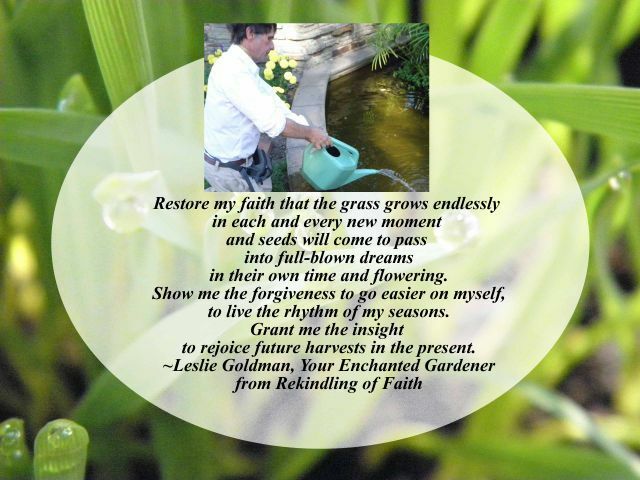 Leslie Goldman, "Your Enchanted Gardener," is known for his inspired poetry, photography, and ability to ground intentions with heirloom seeds. 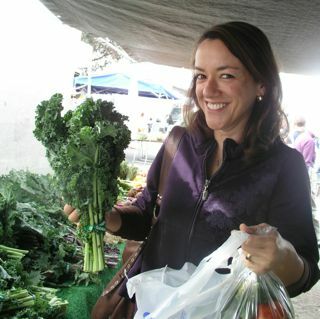 Leslie will do Master of Ceremony work and have two “Grow A Healthier Pizza” sessions: one for adults, and one for Youth. GROW A HEALTHIER PIZZA WITH HEIRLOOM SACRED SEEDS 12:15-1 pm, September 10, Showplace Cafe, Sonoma Fairgrounds, National Heirloom Expo. May all Sacred Seeds Awaken now during These Days of Awe! 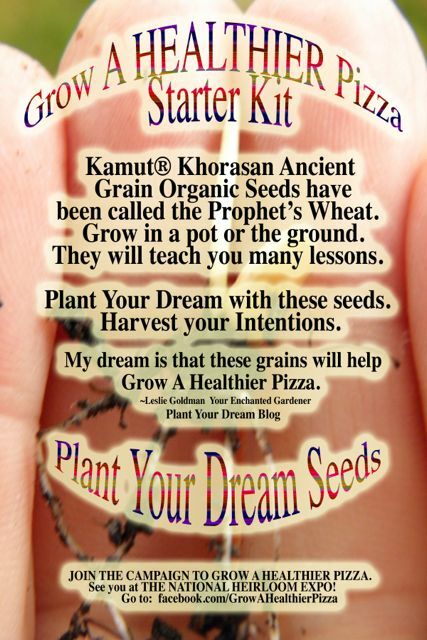 Take Your Sacred Seed Out of the Pizza Box and Plant Your Dream! What does this mean? Today, for many of us, our deepest dreams live in Boxes. We are the equivalent of a piece of Pizza in a box, feeding appetites with food and buying into a system that has no foundation in nature and little technology that can compare to Nature's Original Technology. All this can shift as We Grow A Healthier Pizza with Ancient Wheat and Heirloom Seeds. The Right to Know and Knowing How to Grow Food go hand in hand. 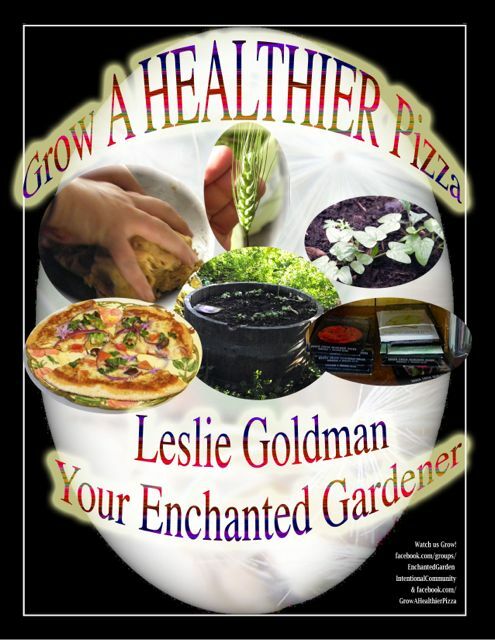 Leslie Goldman, Your Enchanted Gardener, Ceremonialist and Plant Your Dream Blogger, shares inspired graphics and ideas from his book & Campaign to "Grow A Healthier Pizza." Through popularizing seeing Ancient Wheat and Heirloom Seeds as teachers, he aims to Cultivate a Grassroots Movement that outgrows GMOs and returns our beat with nature. Robert Muller, then U.N. Assistant Secretary General, gave Leslie a U.N. Peace Medal in 1983 for the work he would do in his lifetime. That work continues helping us win back our sacred seeds. Youth and teachers will be inspired by ancient wheat as a teacher as we grind grain into flour, and plant our dreams with heirloom seeds. Seeds say: "Turn toward eating organically grown and non gmo foods! Take your Sacred Seed out of the Pizza Box and Plant Your Dream!" (49 Words). My Dream is that you will help Grow A Healthier Pizza. Eminent Gardeners. Be That Gardener. Win Back Our Sacred Seeds. This Plant Your Dream Blog has many of the graphics that I want to include in my presentation. Leslie Goldman, Your Enchanted Gardener stands in a field of incoming Ancient Khorasan Wheat in the growing fields of Rancho La Puerta, the #1 Destination Spa in the world. Wheat is his teacher, and he welcomes Ancient Wheat, and growing indigenous Heirloom Seeds to become your Teacher too! 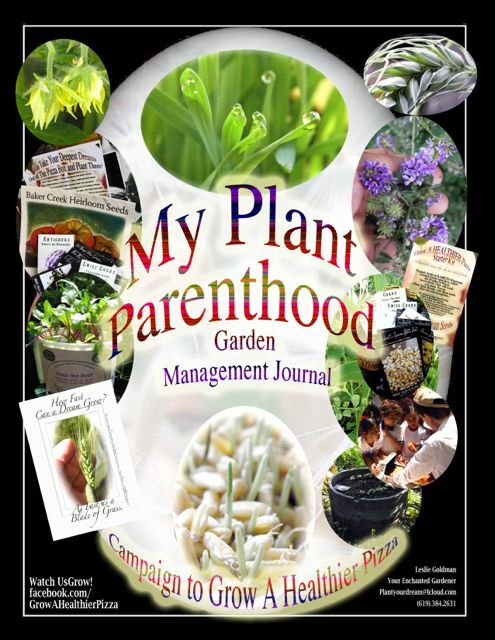 Enter Plant Parenthood and Keep A Garden Management Journal. 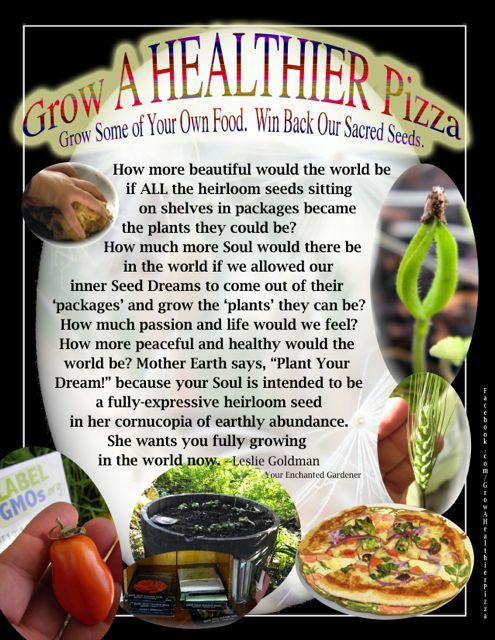 Take Your Sacred Seed Out of the Pizza Box and Plant Your Dream! In doing so, you are helping to usher in a new Enchanted Garden Era based on your deepest dreams inspiring humanity to outgrow short sighted GMO usage and to return to honoring Nature's Original Technology! DEAR BOB, COMPILIATION FOR BOB. THIS IS THE NEW BOOK COVER FOR THE BOOK, "GROW A HEALTHIER PIZZA DRAFT #2"
THE ROAD BACK, "GROW A HEALTHIER PIZZA"
I want to go over the words sentence by sentence with you in the Graphic. I would like you to journey with me to a possible way back from a crash course with destiny that is leading us down a road that leads to pain and suffering. I speak from personal experience. I have lost my beat with nature too. I am do my best to come back to life, as much as I see nature wanting to come back to life through each of us. This material is the basis of the class offerings I will be giving at the upcoming National Heirloom Expo 2013 in Santa Rosa, CA. I welcome you to join us--the 15,000 or more who will gather. "In You, I see the Flowers I love so much in the garden. Nature has smiled on us to make this world beautiful!." I welcome you to study these teachings that I will present wherever you are. THis is the time for an Awakening of Our Sacred Seeds. I want to contribute to your personal awakening through "Grow A Healthier Pizza," the title of this book that I am presenting online. Uncle Sam Needs to enter the Farmbed with "Anti-GMO" if our economy is to improve. That is no position. We need to train youth to Keep the Beat. Start with Growing a Beet in a pot to regain confidence. Move on to planting Organic Alfalfa as a statement where you stand on GE Dereg. We are an Organic Uprising, each of us Standing Up for Nature's Original Technology. Move on to Grow Your Dream with KAMUT ® Brand Knorasan wheat. Experiment with juicing this and for support Read "Health Magic Through Chlorophyll through Living Plant Life" by Dr. Bernard Jensen and Leslie Goldman, Your Enchanted Gardener. 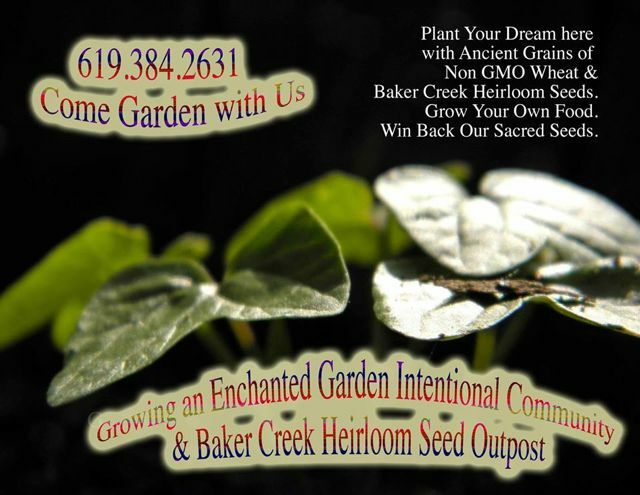 Get Your Heirloom Seed off the Shelf and out of the Package with Growing Baker Creek Heirloom Seeds. All these Growing Projects are part of Grow A Healthier Pizza 2013, our Second Year Campaign. RECOVER YOUR VISION! 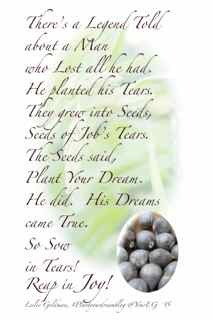 Plant Your Dream with Job's Tears. Get your Prophet Motives Clearly growing in your life. As the Seed Grows, the Dream Grows! Winter 2012- Spring 2013- We are coming home to the strengthen and beautiful our Home Growing Enchanted Garden Intentional Community. We have one room available now. 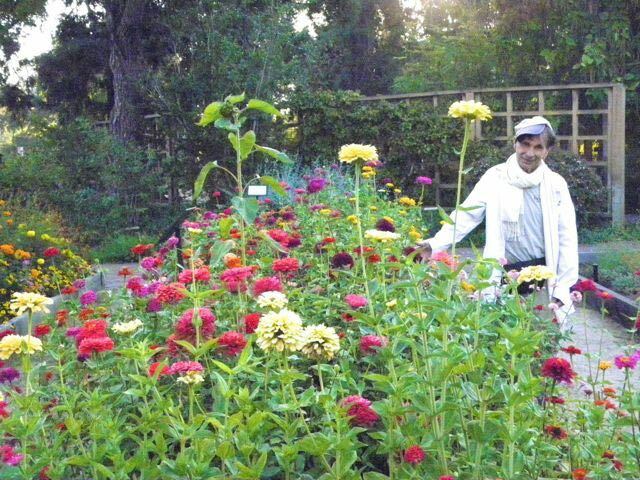 I would like a scholarship fund to support and supplement the training of One or More Garden Students. Rent is $620.00 for a month. Lots to learn here in a Self Study Program of Plant Parenthood. What Aperature and Ibook Does? "Getting Hip" was a theme I had in my life in 2001 when I had to get Hip Revisions. 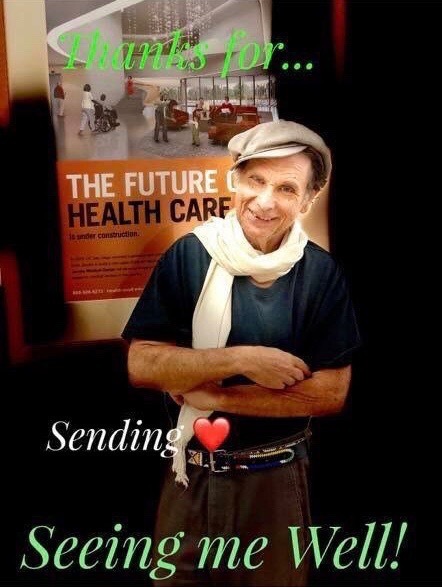 I proclaimed that through my getting needed Hip Revisions, I would help Health Care Get Hip to all it could be." This path, and my extreme physical condition, has led me over the years to make alliances with various QuintEssential Remedies and Health Products that I use and recommend on the Plant Your Dream Blog. AminoActiv® is one such remedy that I use and recommend. This is a Plant Your Dream Blog about This Product and an update of its success that are finally coming in in 2012. In this Plant Your Dream Blog, I write about how I use the product, and precautions that I suggest. With all good things, it is possible to misuse them. YOURENCHANTEDGARDENER will be notified if you reply to this message! Free S&H.Restore lost reserves.J.CROW’S®Lugol’s Iodine Solution Tapeworms, Round worms, Flukes?